The Battle of Prestonpans was Prince Charles Stuart’s first major encounter with Government forces. In a battle lasting less than 15 minutes he defeated the standing northern army that had been intended to counter the Jacobite threat. With only isolated garrisons behind him, Charles was now free to invade England. In April 1689 the first Jacobite rebellion ignited led by John Graham, Viscount Dundee. Supported by Irish troops and Highland Clans he had military success at the Battle of Killiecrankie but was killed in the effort. A number of further battles were fought but the uprising was ultimately defused when on 27 August 1691 the Government offered a general amnesty to any clans who had participated in the uprising provided they took an oath of allegiance. The associated massacre of Glencoe in February 1692 did much harm to this attempted reconciliation. William died in 1702 (Mary had passed away in 1694) and was succeeded by Anne, another daughter of James VII. Her reign saw the Act of Union (1707) merging the Governments of England and Scotland whilst the Act of Settlement (1701) formally barred any Catholics from the throne – both measures were opposed by many Highland clans. So too was the succession in 1714 of the first of the Hanoverian monarchs, George I, whose eligibility came from descent from Elizabeth Stuart, a daughter of James VI. Discontent turned into war in 1715 with a new Jacobite rebellion although this was quickly crushed whilst a third rebellion in 1719 was defeated at the Battle of Glenshiel. Extensive construction of roads and military installations commenced to ensure the Highlands would finally be pacified. By 1744 the Union had seemingly failed to deliver economic benefits to the Highlands and a series of circumstances had put severe pressure on the clan structure. Concurrently war broke out between Britain and France; the latter sought to ignite a new Jacobite rebellion and planned to synchronise that with an invasion of Southern England headed by Prince Charles. But fortunes of war intervened and the French stalled their support. Frustrated by this inaction, Prince Charles fitted out two ships under the pretence of a routine privateering mission. With a frigate called Du Teillay and a man-of-war, the Elisabeth, he sailed for Scotland in early July 1745. The Royal Navy’s HMS Lion intercepted the Elisabeth and compelled it to return to port, but Prince Charles on the Du Teillay pressed on and on 23 July 1745 he landed on Eriskay in the Outer Hebrides. Prince Charles had assumed that Highland support for his cause was still strong but with three previous Jacobite rebellions having been crushed and a road network facilitating easy access for a Government army, few chiefs were ready to support his cause. Only through (false) promises of French support and personally winning over the influential Donald Cameron of Lochiel did he rally any to his banner. By August 1745 though he had announced his intention to repeal the Act of Union and legislate for religious freedom prompting more to join his force. The initial reaction from the Government was muted. Whilst most of the British army was deployed fighting in Flanders, a force of 4,000 soldiers under Sir John Cope was deployed across Scotland to deal with any Jacobite rebellion. By August he was in Stirling and had formed an expeditionary force of around 2,000 men plus two regiments of dragoons. He marched out of Stirling on 20 August 1745 heading for Fort Augustus in the Great Glen hoping to raise independent companies from the loyal clans in the area. But he found precious little support en route and faced a conflicting intelligence picture that suggested a potentially larger Jacobite army was blocking his approach at the Corryarrack pass. Cope diverted to the safety of Fort George (Inverness Castle) but in doing so exposed Edinburgh – there were now no Governmental forces between the Jacobites and the Scottish capital. Prince Charles capitalised on Cope’s error and commenced a march on Edinburgh. Realising his mistake, Cope detached his dragoons to ride to the capital whilst his infantry was speed marched from Inverness to Aberdeen where there was sufficient shipping to move them to Lothian by sea. He had embarked his force by 16 September and sailed for Dunbar with the ships arriving over the next two days. But he was too late; on 17 September Prince Charles entered Edinburgh proclaiming his father James VIII of Scotland. The town fell but the garrison at Edinburgh Castle held firm and with no siege equipment the Jacobites could not dislodge them. In Dunbar Cope was re-united with his dragoons, who had abandoned Edinburgh as the Jacobites approached. He marched out of the small port on 19 September intent on bringing Prince Charles to battle. 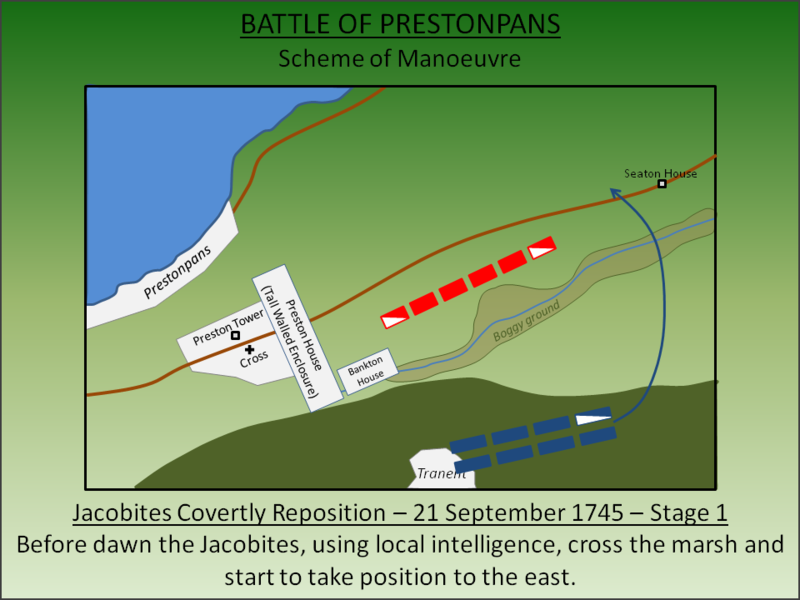 The following day, based on intelligence that the Jacobite army had left Edinburgh and were approaching from the west, Cope positioned his forces on a flat plain at Prestonpans straddling the coastal road. The two forces were roughly equivalent in size although the Jacobites may have had a slight advantage in infantry numbers. The two armies moved into close proximity on 20 September 1745 but the substantive action was not fought until the following day. 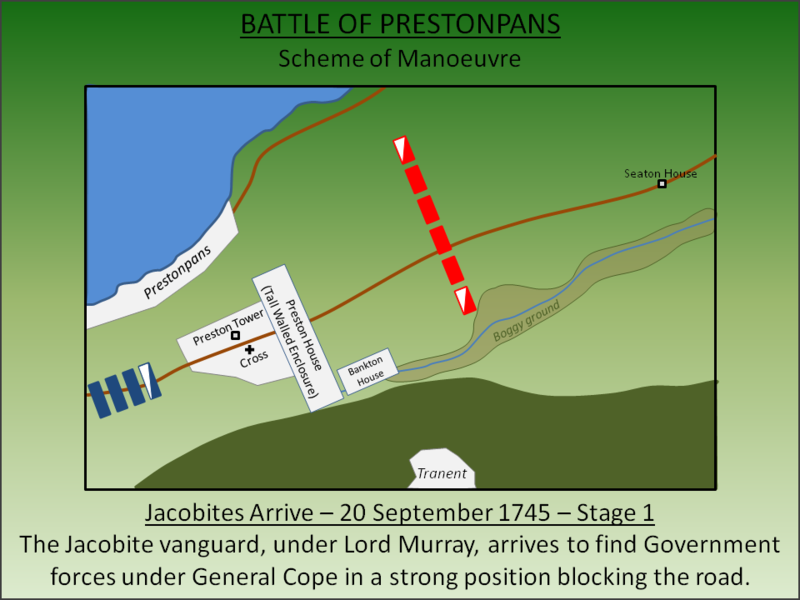 The Jacobite vanguard, under Lord George Murray, arrived at Prestonpans to find the Government troops in a strong position. To their north was the River Forth, to the west the thick walled enclosures of Preston House and to the south marshy ground that would defuse any attack. Murray occupied the high ground to the south near the village of Tranent. Cope accordingly repositioned his forces on a new axis facing south but his position was equally strong – his frontage now protected by the marsh. A frontal assault seemed the only option but this would be costly for the Jacobites albeit they had a larger force – perhaps as many as 2,200 men plus a small mounted contingent (approximately 50 strong). However one of the few Edinburgh recruits, Robert Anderson, knew the marshes around Prestonpans well. A Council of War was convened and the decision made to use this intelligence to reposition overnight. The Jacobites would cross the marsh and attack from the east. 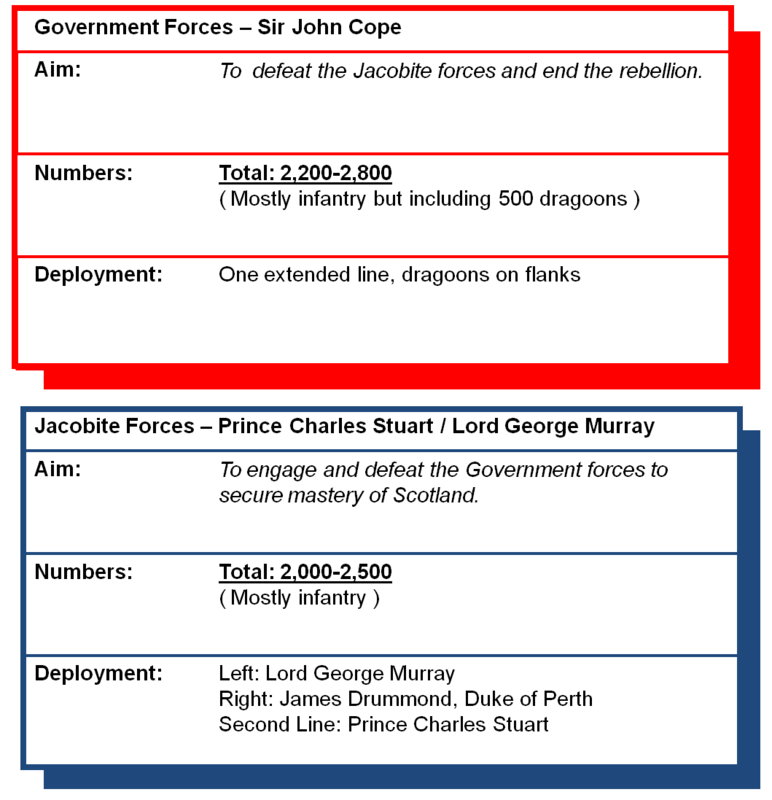 The plan was executed in the hours before dawn on 21 September 1745 with James Drummond, Duke of Perth silently leading the vanguard across first followed by the rest of the army. They were counter detected by an alert Government Dragoon who raised the alarm. The Jacobites drew up in battle formation but their deployment was delayed by a dispute between the commanders over which clans should form the prestigious right wing. Both the MacDonalds and Camerons vied for the position but it was the former who were chosen to the disgust of the latter. With this issue solved, the army deployed into two lines with Drummond in command of the right wing and Murray the left. Prince Charles commanded the second line personally. Potentially dangerously Drummond had led his men too far to the north creating a gap between the two Jacobite flanks. As dawn broke and the morning mist started to clear, Cope found himself in a difficult position. He was now facing the wrong way with his flank exposed to the entire Jacobite army that was now amassing itself in battle order. He hastily swung his force round to face the threat from the east. He configured his force into a single line flanked by dragoons. He had insufficient time to re-position his artillery – cannon and mortars – but was able to turn those nearest the front against the new Jacobite position. Had Cope not been pre-occupied with his hasty change of axis, it is possible he could have won the battle by using his dragoons to exploit the gap between the Jacobite divisions. Instead it was the Jacobites who seized the initiative and launched a Highland charge against the Government lines – a fast advance, firing of a single volley and then hand-to-hand combat with broadsword, dirk, targe and axe. The battle lasted around 15 minutes. On the Government right the men manning the artillery fled at the sight of the advancing Camerons after only a single exchange of fire. Gardiner’s dragoons, directly astern of the gunners, also fled despite the best efforts of their leader to rally them. The Government infantry, largely inexperienced men, were shaken by the dragoons and gunners leaving the field. They managed a single volley but as the Highlanders closed armed with their fierce weaponry, they broke into rout. Few made it far as the high walls surrounding Preston and Bankton Houses barred their retreat and over 300 were killed and 1,400 captured in the subsequent pursuit. Only a few hundred Government troops escaped through a narrow alley that ran between the two estates who Cope led to Berwick-upon-Tweed. Prestonpans was a significant victory for Prince Charles achieved with just 100 Jacobite casualties (30 killed and 70 wounded). Moreover with the exception of a few defiant but isolated garrisons at Edinburgh and Stirling castle plus at the fortresses of the Great Glen - Fort William, Fort Augustus and Inverness Castle (then known as Fort George) – he was master of Scotland. He was now free to invade England which he duly did on 3 November 1745. The defeat finally awoke the Government to the seriousness of the threat and prompted the recall of Prince William Augustus, Duke of Cumberland and his army from Flanders. On 1 October Field Marshall George Wade, who had been recalled earlier in the month, was ordered to take position in the north and duly marched to Newcastle in October. Ultimately the Prince’s English invasion, facilitated by his victory at Prestonpans, ended with him reaching Derby on 4 December before being compelled by his senior Generals to return to Scotland. Nothing had been gained and he now faced a serious threat posed by the Government's continental army - comprised of professional, battle-hardened soldiers - marching to intercept him. The next major battle would be fought at Falkirk in January 1746. At Prestonpans the Government troops had no counter to the Jacobite broadsword and targe (small circular shield) attack. When the soldier attempted to stab with his bayonet he was deflected by the shield and then left open to attack - half the reason why the troops broke so easily during the battle. By Culloden the following year, the troops had been drilled to work in partnership and always stab to the right no matter what was coming directly at them significantly reducing the effectiveness of the targe. The Romans had used a similar tactic 1700 years before. Battlefields Trust. 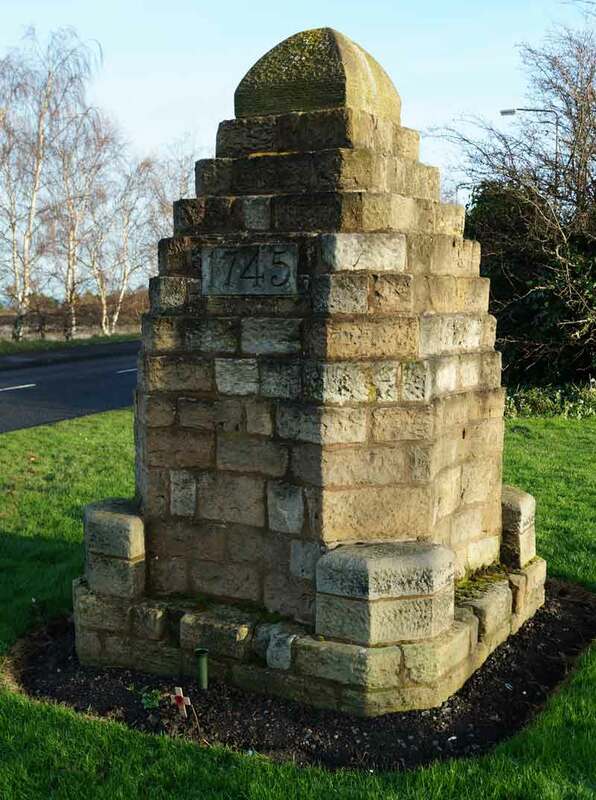 Battlefield Report: Prestonpans (1745). Historic Scotland. Lancaster, J.H.D (2014). 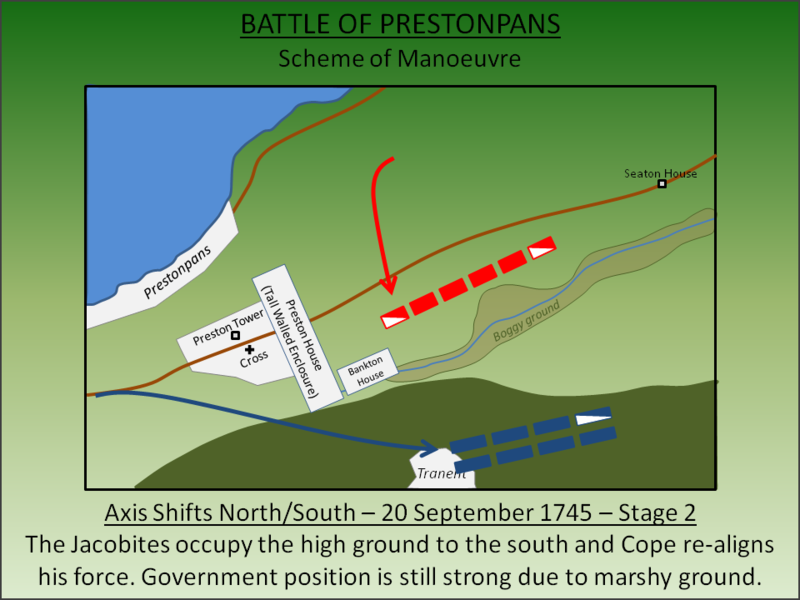 Prestonpans: Battlefield visit notes and observations. CastlesFortsBattles.co.uk. A viewpoint has been created to allow visitors to appreciate the terrain of the battle a portion of which remains undeveloped. There are also two monuments and a number of interpretation boards. Preston Tower and Market Cross are nearby - both on the retreat route of the Government forces. Gardiner’s Monument. A monument to Colonel Gardiner who died valiantly trying to rally his ineffective dragoons. Prior to the battle he allegedly had a premonition it would be his last action. Memorial Cairn. Positioned on the main road close to the actual scene of fighting. Prince Charles Stuart Banner. The Prince’s banner flies from the viewpoint. Prestonpans. The battlefield as seen from the viewpoint. Preston Tower. The associated estate was originally surrounded by a tall wall that prevented many of the Government troops from escaping. Viewpoint. The battlefield viewpoint is a huge boost to the site offering an excellent vantage point of the location of the action. The viewpoint is a slag heap - a by-product of Prestonpans coal industry. Clearly this high ground wasn’t here in 1745. The viewpoint is to the South East of Prestonpans but is easily found (and sign-posted) off the B1361. There is a car park near Meddowhill Sports Centre.